​ and to educate interested persons about the Township's place in history. The historical society was organized in 2001 and recognized as the official historical society of Lehigh Township on February 13, 2001. 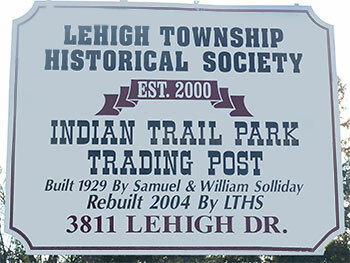 On April 23, 2001 the society was incorporated as a *non-profit corporation in the Commonwealth of PA. A 29 year lease was signed with the Lehigh Township Supervisors in November of 2002 for the building known as the "Trading Post" and one acre of ground. St. Paul's Schoolhouse served as the society's temporary museum from 2002-2007, until the Historical Centre was built in Pennsville. The grand opening of the Lehigh Township Historical Centre was held on July 14, 2007. In June 2007, the L.T. Historical Society signed a lease with St. Paul's UCC of Indianland to restore and maintain St. Paul's Schoolhouse with the stipulation the building be opened to the public as a museum. The grand opening of St. Paul's Schoolhouse was held on July 10, 2010. The two buildings are maintained by society members. Through dues, fund-raisers and donations (plus a few small grants), the society has managed to make remarkable progress over the past 14 years. In 2016 we mark the milestone of 15 years as an active historical society! The Historical Centre houses memorabilia, mainly donated by members and township residents, plus displays, photos, maps, and genealogy information. A visit to the Historical Centre is a step back in time. 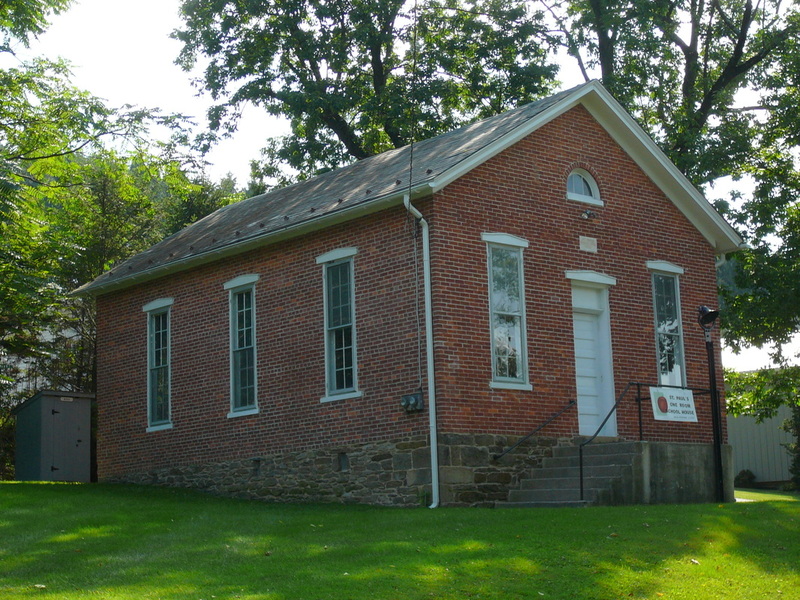 The St. Paul's Schoolhouse is a good example of early educational architecture in the United States. The Schoolhouse contains donated artifacts which were used while schoolhouses were in operation and has a one-room classroom setting for grades one through eight. The Schoolhouse which was built in 1865, closed in 1951. 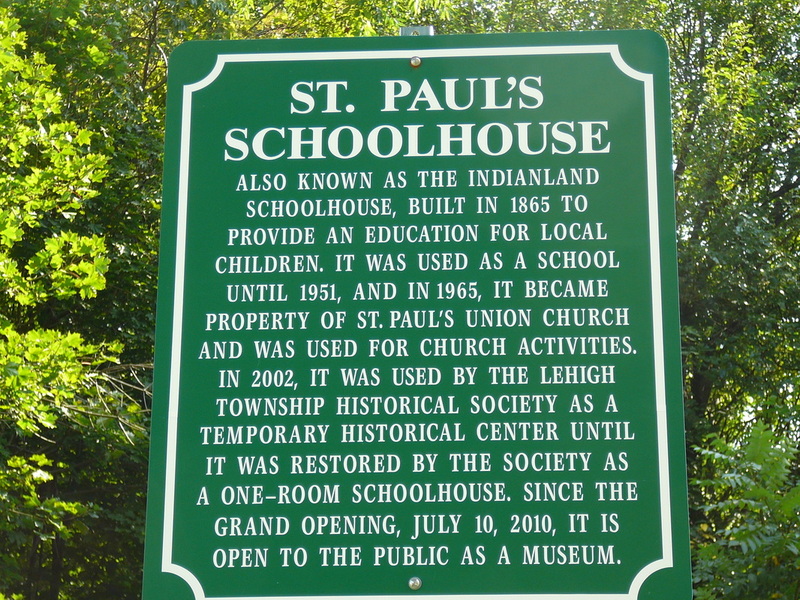 In 2015 the Society celebrated the 150th anniversary of St. Paul's Schoolhouse. The Society encourages you to visit the Historical Centre and learn what life in Lehigh Township (and the surrounding communities) was like over the years. The Schoolhouse provides a heritage education to school children and adults. The Society recommends a visit to experience firsthand a day in the St. Paul's Schoolhouse. The Historical Society completed an addition to the Centre to provide office, research, library and meeting space along with restroom facilities. The grand opening of the addition was held on May 4, 2014. 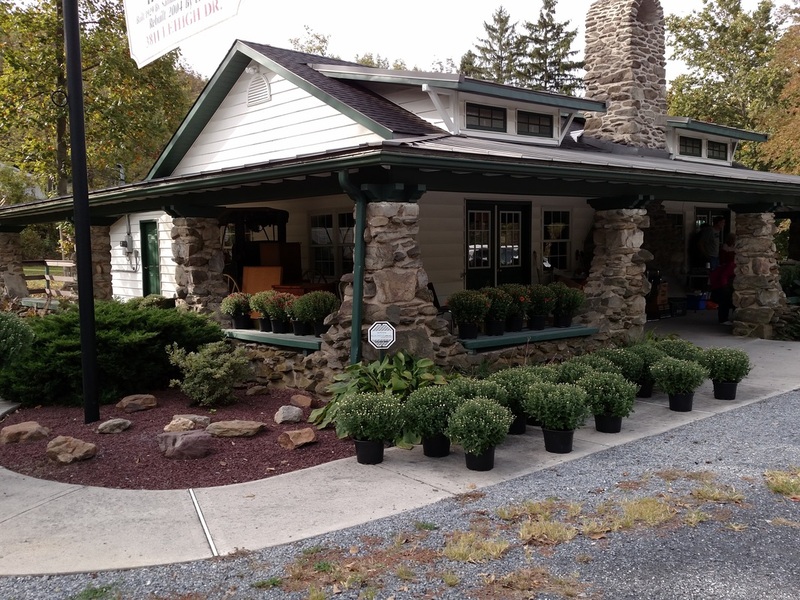 The Lehigh Township Historical Centre is open from mid-May through September on the second and fourth Sundays of each month, from 1 pm to 4 pm. It is also open for holiday shoppers on selected dates in December. The Historical Centre and St. Paul's Schoolhouse are open by appointment for individuals and group tours. Call the Centre at 610-440-0151 and leave a message. *The Lehigh Township Historical Society is a 501(c)3 non-profit organization. Collect, archive, preserve and display items from Lehigh Township's past. Promote public awareness of Lehigh Township history. Preserve and maintain the Historical Centre and St. Paul's Schoolhouse. Continue to grow the Lehigh Township Historical Society membership. For news and updates, find us on Facebook.